CADWorx Productivity Tool: BubbleWorx Released! ECE Design is pleased to announce the availability of a new CADWorx Productivity Tool: BubbleWorx. 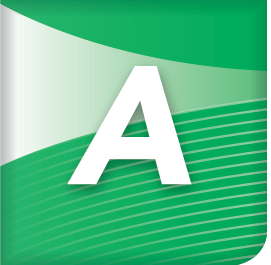 BubbleWorx is an AutoCAD Palette plug-in for Intergraph’s CADWorx Plant Professional to help improve drawing deliverables. 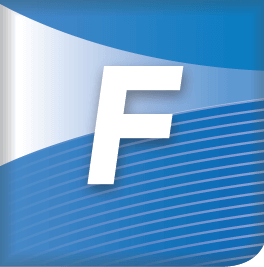 Master Material List Bubbling – This function allows you to tag instruments, isometric supplementals, and material id’s utilizing the same mark numbers throughout an entire project. Tag Bubbling – This function allows you to leverage the ‘tag’ field or the ‘Isogen Message’ field within CADWorx Plant Professional to bubble components. BubbleWorx is easy to configure and designed to make your Isometrics, Orthographic, and Master Material Lists drawing production faster while staying ‘in-sync’ with your 3D Model! BubbleWorx has an introductory price of $500 and $150 maintenance. An Evaluation Copy can be downloaded here. Please take a look at the following introductory video. If you would like to set up a netmeeting for us to demonstrate all the features and functions please contact us. Please click here for details on the update made for this service pack update. For more product details on TANK, visit here. To view full class descriptions, please click here. To read the bios of our instructors, click here. 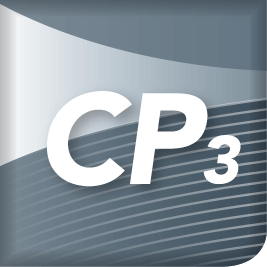 Open up the CADWorx Catalog and Specification Editor. 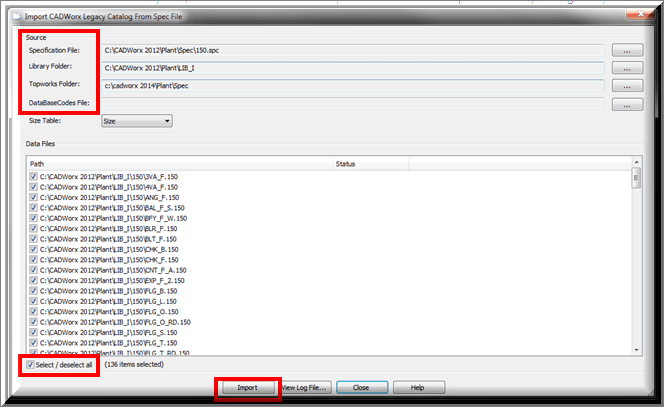 Click the File dropdown and click New Catalog as shown in Figure 1. 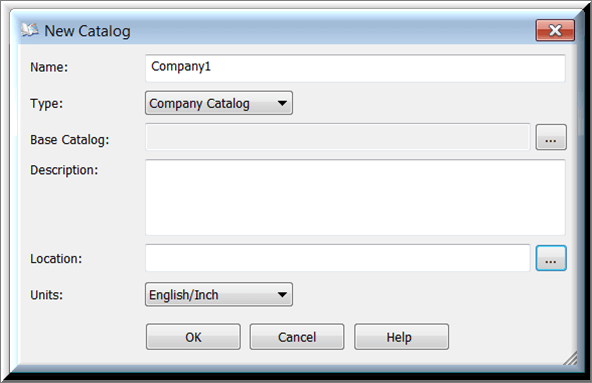 As shown in Figure 2, the New Catalog dialog window has six categories that need to be filled out. Name: Specify a name for the Catalog. Type: Choose between Company, Industry, and Global Catalog. Global Catalog should typically be chosen. Base Catalog: It is not necessary to select a base catalog because a new one will be created from scratch. Description: A description for the Catalog is optional. Location: Specify the location of where the Catalog will be stored. 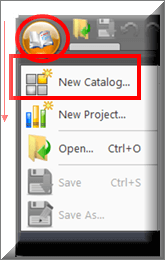 Once everything has been selected in Figure 2, press OK.
Once the New Catalog has been created, click the Catalog Data button located on the Ribbon below in Figure 3. This will open the Transfer Catalog Data dialog window and an automatic prompt will pop up asking “Would you like to use the current catalog for target?”. Select Yes. As shown in Figure 4 below, There will be two Directory Boxes at the top of the window: Target and Source. Target will be filled out automatically because of the “yes” selection at the autoprompt. 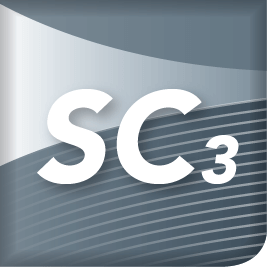 Specification File: This will be the legacy specification file that is to be used for the new catalog that is being created. Library Folder: This is the folder where the legacy library folders are located that are to be used for the new catalog that is being created. Topworks Folder: If there is any Topworks being imported then this is the location they will be imported from. The default is the 2014 CADWorx Spec folder and does not need to change if there aren’t any that need to be imported. DataBaseCodes File: If there are any Database Codes being imported then this is the location they will be imported from but can be left blank if there aren’t any to be used. Once all of the specification files that are required have been imported, press close. Save the Catalog that has been created and that will be the last step in creating a new catalog. Open up the CADWorx Catalog and Specification Editor. 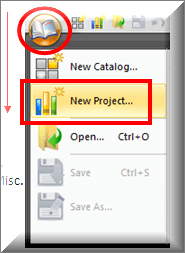 Click the File dropdown and click New Project as shown in Figure 7. 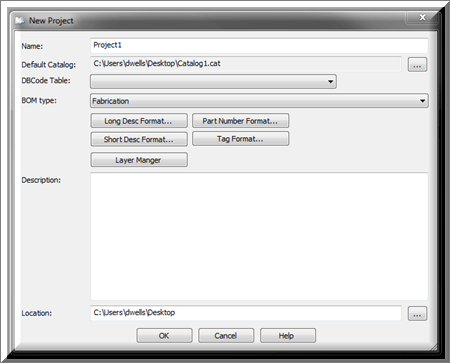 In the New Project dialog window shown in Figure 8, there will be six categories that will need to be filled out. Default Catalog: Choose the Catalog that the Project will be using. In this situation, the newly created Catalog can be used. DBCode Table: This will be blank if there aren’t any DBCodes used. BOM type: Choose between Fabrication, Erection, Offshore, and Miscellaneous. Fabrication is defaulted and is typically used. Description: A description for the Project is optional. Location: Specify the location of where the Project will be stored. The five buttons below BOM type can be left alone at this time. Once everything has been selected, press OK. In the Import Legacy Specifications dialog window, there will be two directory paths to select: Specification and Catalog. Specification will be the legacy specification that is being imported. Catalog is greyed out because the Catalog was specified earlier. After the specified legacy specification has been imported, the Specification Editor will automatically create end type tables for all of the legacy library data files. Open up the Catalog and expand the EndType Tables in the Catalog Data window and then expand one of the six options (See Figure 11 below). Since each EndType Table was created based on the different Data Tables, they will need to be consolidated into a single EndType table for each class. 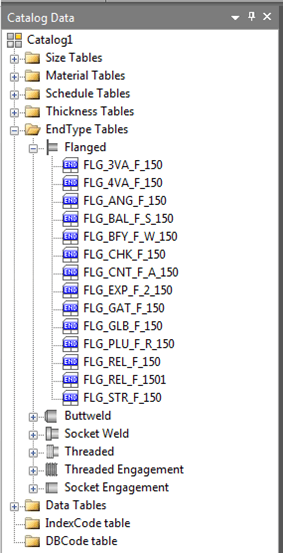 In this case, the 150lb class Flanged end types will be consolidated into one table. 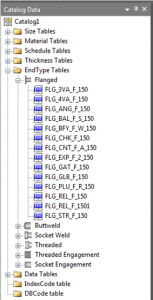 Rather than creating a new EndType Table and adding every size, choose the table that has the largest range of sizes in use and rename it to a basic name (FLG_150 in this case). Then, add the missing sizes required by right-clicking on the MAINSIZE column and choosing “Add MAINSIZE…” (See Figure 12 below). Once the sizes are added, fill in the empty columns for the new sizes by either manually entering them or copying them from a different EndType Table. Now that the EndType Tables have been consolidated, the corresponding Data Tables need to match. 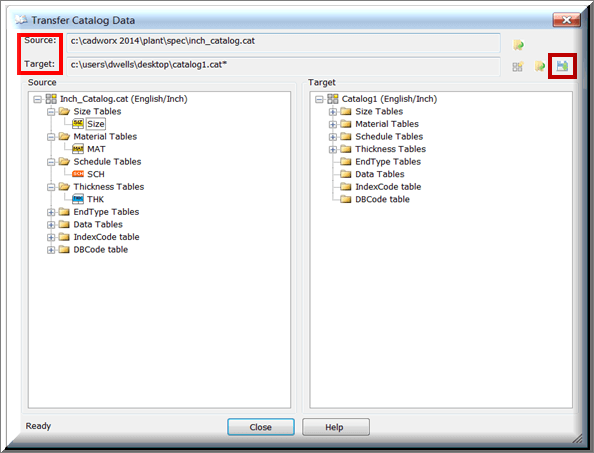 Expand the Data Tables in the Catalog Data window and open up the the data tables that match the newly created EndType Tables. In this situation, the Valve Data Tables all tie together with the EndType Tables (See Figure 13 below). Once each Data Table is opened, select the Start dropdown in the Default EndType Data Table Setup and choose the correct EndType Table (See Figure 14 below). After all of the corresponding Data Tables have been updated to the combined EndType Table, remove the unused EndType Tables by right clicking on each and selecting Remove. Once all of the specifications have been imported, EndType Tables combined, and Data Tables updated to the correct EndType Table, the Catalog and Project can be saved and that concludes the Spec Conversion for both Catalog and Project. 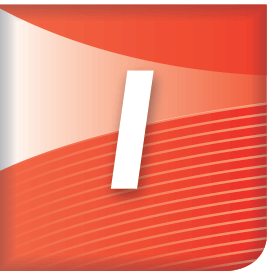 CADWorx Productivity Tool: PIDMO is a Tool for Intergraph CADWorx P&ID Professional. PIDMO is a database interface application that is easy to configure and use. Applying its Excel exporting and importing capabilities enables engineers, managers and administration resources to efficiently and effectively manage data for engineering, design, construction, and operations on Intergraph CADWorx P&ID Professional projects. In a nutshell, PIDMO allows corporate wide access to your CADWorx P&ID data allowing you to finally achieve the benefits of “Intelligent” P&ID’s!